Belts, like all fashion accessories, change in popularity and style from season to season. While there are standards in belts that never change because they are simply classic, most belts come in styles that ebb and flow in popularity. What is hot one season may be totally out a year later. Buying belts is a complicated affair that requires much more than measuring your waist. 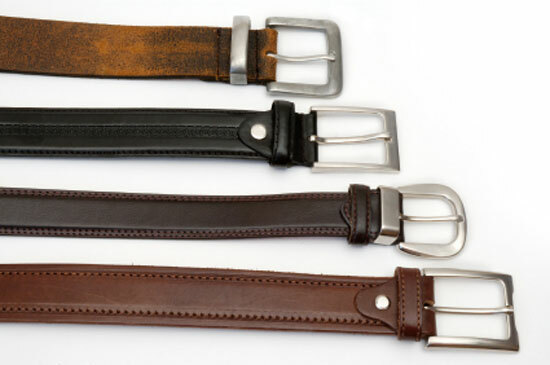 If you are in the market for a belt, it is vital to know which type of belt best matches your style and body type. If you have a thick waist a belt that droops a little will distract from your shape. If you have a tiny waist or an hourglass figure and want to show it off, a wide or intricate belt is a must. For anyone who is heavier but needs to wear a belt, thinner is better. Check the size of the belt buckle. If you are looking to draw attention to your waist, large, unusual or ornamental belt buckles are for you. However if you are like most people and don’t want the eye drawn automatically to your waist, opt for discrete, plain belt buckles that blend in well with the outfits you wear. Choose a belt that is in a good color for you. In fact you may even want to opt for a two tone belt with a reversible buckle. These are good choices for both men and women because of their versatility. You should have belts that are the same colors as the shoes you wear most often and for women also the same color as their favorite purses. While it is not necessary to always match belts with shoes and purses, having belts in these colors is a good indicator that they will be regularly used. You will also want to choose the right material for your belt. If you like noisy belts that draw attention, metal ones are the way to go. If you are looking for a good strong one that will last a long time leather is the best choice. If you want a light colored one that looks summery or tropical, a web belt will fit the bill. Vinyl belts are only a good choice if you want something to be worn very infrequently and something that is cheap. Elastic belts help to create trendy looks but are often specific to a certain outfit. You can find rhinestone belts and other jewelry belts that will definitely add bling to an outfit. If you are looking to buy a belt online, you might consider Belts.com, Old Navy, Belt Master, Overstock.com, Menswallet.com or Neiman Marcus. These sites give you a great selection of both men’s and women’s belts in a variety of prices, colors and styles. While this is a great place to start, you can also do a more specific Internet search for the exact type of belt you want. Be as descriptive as possible and in no time you will find the belt of your dreams online. Get outfitted with a new belt, one of the best accessories ever.